This is calculated with the full load of 25A going through the cable, so with a lower load you would get a higher voltage. Real world conditions may be different. I would suggest using a shorter cable with thicker conductors. A big electrolytic capacitor or a super capacitor at the ROV end would help to buffer this voltage too. The thrusters need 12V to run and are in fact still running up to full speed so we don’t appear to be losing too much through tether resistance. We did the test with 10AWG cable too and had the same problem. Ultimately we’ll operate with 60ft - we just had 100ft unwound from a reel. 25A is the fuse with some overhead. We’ll likely only ever draw up to 15A based on measurements with a meter from the last ROV built using the same thrusters. Last year we had that 15A running 60ft and still working, but with a network cable rather than network over power. I should mention that the power for the Tenda circuits (which is isolated from the tether power) was not tapped off the tether for the test - they were powered from a separate power supply. Is there a good equation and suggested model for a electrolytic capacitor? Btw, the IP cameras ‘require’ 12V to run. They contain a little RTSP board. They take time to boot up, and do not reboot when the thruster surge happens, but an ongoing ICMP ping to them drops inline with frame drops and the flashing network port on the end of the camera cable is seen to stutter. That’s plugged straight into the Tenda. Interesting… Given the thrusters run at full speed, and while using a network cable it functions correctly; it could be noise related or possibly due to inrush current??? I would suggest a 0.1uF 50V mono / ceramic capacitor for filtering noise. It’s highly likely the tenda adapters (and other components in your system) will already have some filtering across the tether and / or voltage supply. If it’s inrush current to the motors I would suggest an electrolytic capacitor 1000uF (or greater) rated at 25V. 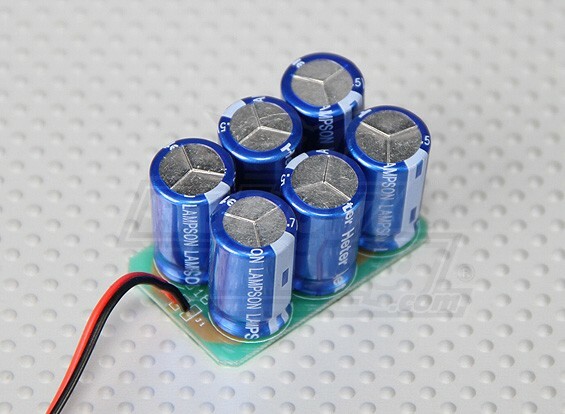 You can experiment with the placement of these caps, and also use of multiple capacitors; e.g. at each end of the tether, across voltage supply to tenda, across voltage regulators, on power to ESC’s and see if it makes any difference. Are the thrusters submerged for these tests? And is the cable a twisted pair or figure 8? The thrusters are water-lubricated so they are in a bucket of water for these tests. We tried it with them moving around freely and holding the mounts in place. The 8 and 10 AWG cable is figure 8 zip cable from PowerWerx. Once a thruster is eased on, I can turn them up (PWM controller) and down gently with no interruption for the most part. Occasionally when starting them in either forward or backward direction, the network interruption appears to happen, sometimes. This one is .78F which I thought may help to cover some momentary power draw. Would the filter capacitors potentially strip out the signal? A filter capacitor attenuating or removing the signal is a possibility, but it can usually be fixed by substituting a different value capacitor. From your further descriptions of your setup and the fault, a momentary voltage drop due to motor inrush current is starting to sound much more probable than a noise related issue. The capacitor bank in the link would be an excellent choice for preventing said voltage drop. I would suggest installing it as close to the ESC’s as possible. It may power the ROV for a while after the power is removed from the tether, and it will probably increase the time it takes the ROV to boot up. There are two potential problems here, and you’ll need to do some homework to figure out which is the culprit. The first possibility is that turning on the motors drops the DC voltage at the payload enough that the network circuitry has problems. The second possibility is that the motor controllers (ESCs) create electrical noise within the communications bandpass of the homeplug adapters (2 MHz - 30 MHz), which interferes with the operation of the homeplug adapter. You first need to perform a test to see which issue it is. You can do this by rigging up a test to run your ROV networking and CPUs off a battery pack, but sharing a common ground with the ESCs (which will still be powered over the tether). If dropouts still occur with the battery power, then it’s not an issue with voltage drops over the tether. If the issue is RF interference with the homeplug signal, then you’re going to need to get some big ferrite beads that can handle the current of the ESCs, and place them on the power leads going to the ESCs. This will keep RF energy from making its way from the ESC back to the tether. There’s a lot going on here that can’t be explained in a simple forum post. You may very well need to find an electrical engineer to advise your group, and round up an oscilloscope to take a detailed look at what’s happening on the tether. If you’re just using the Tenda units on their own, you don’t need any extra components, as they use capacitors and a transformer to isolate themselves from DC and low-frequency AC on the tether. If you’re plugging the modules into OpenROV topside adapters, then you need to pull off one or more resistors from the topside unit to make sure that the USB 5V power is not placed onto the tether. Get the schematic for the topside adapter off of our Github site and read the notes. It will take a week or two to get the capacitor packs from Hobby King which I already ordered. I only have a couple of 1000uF on hand. We actually have a Voltera PCB printer that we haven’t got running yet, so we could make our own with the right caps. I wouldn’t think a temporary breadboard setup would be good to handle the current? In the meantime, we’ll experiment with isolating the source of the issue. As mentioned, we currently have the Tendas powered by a separate USB-power hub (plugged into the wall) since we are waiting for some USB-mini connectors (that the tenda topside interface board uses), and so there’s also currently no shared ground. One other query I have in mind for later is whether HomePlug signal is susceptible to general RF. If someone operated an ROV nearby perhaps using a similar system, is their use, or any other noise on the 120V AC power in the building likely to mess things up? @Walt_Holm Just to stay ahead of the possibilities while waiting for other pieces, do either of these ferrite beads (available from DigiKey) look suitable? From their datasheets they appear to provide impedance nicely over the 2MHz to 30MHz range and can handle 10A - so one per motor controller +12V line - all on a single custom PCB. I assume there are no suitable snap-on beads for this frequency range and that snap-on is not as effective as in-line? I’m wondering if it would also be good to have one on the surface to prevent any interference from the power supply or mains power, but that would need to be rated to 20-25A which is harder to find. Note that the core impedance drops as a function of DC bias current, which in this case is going to be quite high, maybe 10A or more with the motor running on full. The datasheets for the beads don’t show impedance under load. I’d just select a bead that is as large as is practical in your design, hoping that the large mass of ferrite minimizes saturation problems. Any wrapping/turns or just straight through? So only the +12V or both +12V and GND leads? such as the TP-LINK TL-PA8030P? I purchased actiontec 500 mbps homeplug adapter which works the same as yours.I been trying to figure out what the pc 3 100uf 25v, pc8 10uf 400v and pc9 1000uf 6,3v do my circuit board which is only one board not two like yours. The cap I am really interested in is the pc8 10uf 400v? Why is their a 400v cap on this board when it also has mov to protect circuit? One of units went bad to leds and no power. Caused by defective pc9 1000uf 6.3v cap. so what does pc8 10uf 400v do in this circuit. Yours may not have same values by should work the same way. I’m curious if there was there any more testing with bandwith over 100m of tether out? I’m considering getting 300m for a coming up dive but I’m wondering how bad the video feed is going to be…? A couple of years ago we did some tests here at OpenROV HQ, seeing how the bandwidth drops off at distances up to 200m or so. I looked around a bit for the data, but can’t seem to find it- maybe I’ve got it stashed in my files at home. My memory is that Homeplug bandwidth falls off pretty considerably at lengths over 100m, but it is still usable for controlling the ROV. Several years ago we took a heavily-modified OROV 2.6 to a depth of 260m, and that had the original camera that outputs MJPEG. The ROV still ran fine with about 300m of tether out, though the camera frame rate had dropped to maybe 5 Hz or so. If you’ve seen the video footage from last May’s survey of the sunken SS Tahoe in Lake Tahoe, that was shot using the pro camera modification at a H.264 video bit rate of 3 Mbps. We were not able to use a higher bitrate, as we were live-streaming to the internet at that time, and that was the speed of the internet connection that we had. I suspect that you’ll still be able to get 3 Mbps over 300m of tether, so if you have the pro camera (H.264 camera), the footage from the SS Tahoe will give you an idea of about what to expect. Hope this helps. If I find our original test data I’ll let you know. The camera , i.e. “the source” ( high bandwidth) would have to get chopped up into multiple sources, fed through multiple tether wires, then recombined at the surface. I am using these to try to combined two slower DSL internet ISP’s to give me an effective higher Internet connection. Maybe readup on them to see if there is way to “turn it around a bit” to achieve your goal. An IT person would be good start. Yes, there are gizmos out there to chop up an Ethernet feed into multiple streams. However, I’m not sure it would be a good choice here. We specifically use two thin conductors in our tether in order to keep the cross-section of the tether as small as possible- every bit of copper needs to be compensated with foamed plastic to keep the tether neutrally buoyant. For the depths up to 100m or so, HomeplugAV and similar Ethernet-over-Power schemes can provide 100Mbps over a single pair. Do you really need a faster feed? There are plenty of professional ROVs that use fiber-optic tethers, and it’s probably a necessity once your tether lengths get beyond 1 km or so. But fiber-optic tether is extraordinarily expensive, mainly to make it handle the tensile and bending loads that ROV tethers are exposed to. on jan 2016, it was discussed that the trident will be powered through the tether, is it now the case? If yes, or if not, what where the lessons learned ? I am still looking into building a rov with power through the tether.